Elsevier, part of the RELX Group, used our syndication service to import NICE guidelines into their ClinicalKey clinical search engine. How did you find using the NICE Syndication Service and the API? The NICE syndication service provides a quality assured process to deliver digital content - an important requirement for robust and efficient data retrieval. The API, which is based on web services and REST principles, was a good fit with ClinicalKey's solution architecture. The structured XML formatted data returned from the API allows accurate indexing and categorisation of the guidelines within ClinicalKey, resulting in an excellent search and viewing experience for the end user. Developers found the API intuitive and straightforward to use. The documentation we provided allowed the development team to complete the work without delays or complications. What benefit does NICE content bring to your users and your business? Having NICE guidelines in our clinical solutions is extremely beneficial to users looking for evidence based recommendations relevant to their healthcare setting. Healthcare professionals in the NHS can embed clinical decision support based on trusted recommendations directly into their workflow, supporting their decision making process at point of care. Demand for NICE guidelines in ClinicalKey is not just limited to the UK; Elsevier's global customer base can now benefit from access to these guidelines. Usage is expected to be high outside the UK due to NICE being internationally recognised as a contributor to better health outcomes across the world. NICE guidelines extend and complement our existing evidence based offerings. They make sure our solutions meet the needs of clinicians and decision makers in the NHS and other healthcare bodies in the UK. Tell us about Elsevier. What's your relationship with the NHS and other health-related organisations? We help healthcare organisations to be more efficient and improve clinical outcomes. We do this through the delivery of expert opinion, peer-reviewed and evidence based content and decision support tools. We provide over 25% of the world's clinical content and serve over 20 million health professionals globally. Our solutions support the use of clinical pathways to create quality improvements and efficiency gains. Clinicians in acute hospital settings use our products at point of care to get quick access to information that will inform their clinical decisions. Order Set and Care Planning: tools for clinical workflow. How did you use syndication to integrate NICE content within your product? The 'Guidance Data Service' is used via the NICE API to transfer guidelines content into ClinicalKey. An import using the REST service, which returns XML formatted data, is fetched daily via the API. 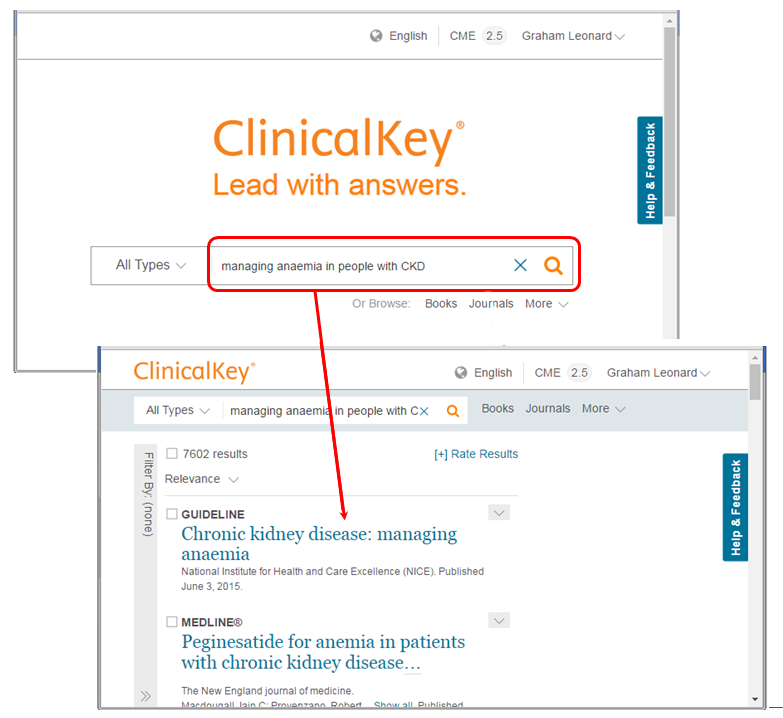 This augments the existing content within ClinicalKey's content database. Do you have plans to use NICE content in other areas? NICE content is already referenced in many types of content across the Elsevier portfolio. It is also used as source material in our Arezzo Pathways clinical decision support solution. We look forward to exploring possibilities for using NICE syndicated content in applications beyond ClinicalKey.